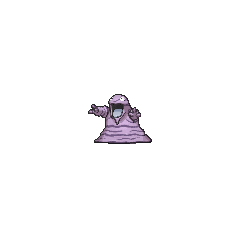 Alolan Grimer in game: 1,130 Who? Important notice! Pokemon Alolan Grimer is a fictional character of humans. Grimer (Japanese: ベトベター Betbeter) is a Poison-type Pokémon introduced in Generation I. It evolves into Muk starting at level 38. In Alola, Grimer has a regional variant that is Poison/Dark. It evolves into Alolan Muk starting at level 38. 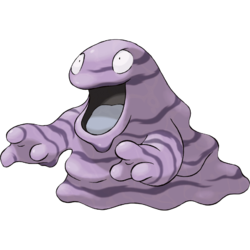 Grimer is a slimy, amorphous blob-like Pokémon, made of living purple sludge. Its body contains a variety of pungent bacteria, which are so potent that it renders soil barren and incapable of supporting plant life. It has two large eyes with beady pupils, and a gaping mouth with a grey tongue. While it lacks any visible legs, it does have two arms with three digits on each hand. It is constantly oozing; endlessly leaking a bacteria-rich fluid from all parts of its body. Pieces of it often breaks off during travel, and from these pieces new Grimer will begin to grow. When combined with another Grimer, it produces new poisonous compounds. Due to its lack of a solid form, it is capable of squeezing into any space or crevices with relative ease. It uses this to penetrate sewage pipes so that it may feed off of the filthy waste water inside. It happily consumes and thrives off nearly any form of waste or refuse. It can be found in polluted lakes and streams, as well as within cities and factories where trash and industrial waste can be found. Grimer was brought to Alola to deal with the excess waste generated by the region's increased population. However, with little liquid sludge to feed on, it took to eating solid garbage instead; this steady diet of trash caused its form to change. This variant's body is green with a line of yellow sludge along its lower lip. It also has two "teeth" in its upper jaw; these are actually crystallized toxins formed from the garbage that Grimer has been eating. It is not known how to break down these toxic crystals, but direct contact with them is known to be dangerous. Lethal poisons leak out of Grimer's body when these crystals fall out. Grimer is perpetually hungry and must constantly eat trash; if none is readily available, it will eat other manufactured products instead. Because it stores its toxins within the crystals, Alolan Grimer does not produce a foul stench like the standard version. In Pokémon Scent-sation!, Celadon City Gym Leader Erika told a story about when she was a youngster: She got lost one day and ran into a Grimer. However, a Gloom chased the Grimer off and saved her. Ash and his friends first encountered Grimer in Sparks Fly for Magnemite. A Muk and a large group of angry Grimer were gumming up the turbines in the power plant in Gringey City, causing a city-wide power loss. Dawn temporarily trained a Grimer in Camping It Up!. A Grimer was among the Pokémon controlled by Cassidy and Butch in Pikachu Re-Volts. Four Grimer appear in a flashback in The Joy of Water Pokémon as former inhabitants of Lake Lucid before becoming the clean lake it is now. EP030 Grimer Ash's Pokédex Grimer, a Sludge Pokémon. Born from sludge, these Pokémon specialize in sludge attacks. DP088 Grimer Dawn's Pokédex Grimer, the Sludge Pokémon. It was born when sludge in a dirty stream was exposed to X-rays from the moon. A Grimer made an appearance in The Lake of Rage, under the ownership of a Team Rocket Grunt. Koga wears a Grimer on his shoulder in the form of a ninja outfit in Go for the Golbat. He used it extensively to smother Blue, preventing him from breathing and restrict his movement so that he would be unable to call on his Pokémon. He again used it in the battle with the evil Elite Four Agatha, to little effect. In A Flaaffy Kerfuffle, a Grimer appeared as one of the Pokémon in Professor Oak's fantasy when he explains that Trainers should only have six Pokémon with them. Koga's daughter, Janine, is later seen with a Grimer. She uses it against Falkner during the Gym Leader faceoff, using its Minimize attack to outwit his Noctowl. A Grimer was one of the Pokémon sent to help the fight in Ilex Forest in The Last Battle XIII. 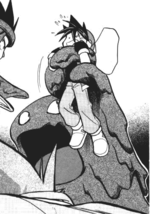 Koga owns a Grimer in the Pokémon Pocket Monsters manga. Sludge that was transformed when exposed to X-rays from the moon. Loves sludge, industrial waste and other refuse. When two of these Pokémon's bodies are combined together, new poisons are composed. Its main source of food is the slimy industrial waste of factories. This Pokémon's numbers have been decreasing in recent years. Alolan Grimer has the same stats as a regular Grimer. Moves marked with a superscript game abbreviation can only be bred onto Grimer in that game. 51%-100% HP I'll attack with Sludge! Hahaha! 26%-50% HP My HP's down to half. It's no laughing matter! Level up Leveled up! Hahaha! 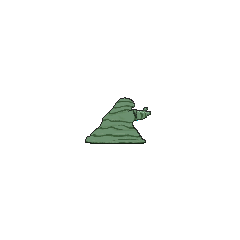 Grimer hurls blobs of sludge. Also beware of the sludge trail it leaves behind. The more Grimer in the puzzle area, the more damage. 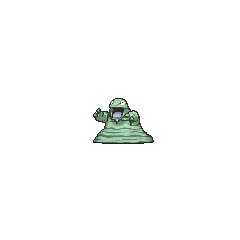 For other sprites and images, please see Grimer images on the Bulbagarden Archives. In Sparks Fly for Magnemite, Grimer's anime debut, Grimer had a very strong odor that made most people around the Grimer cover their noses from the smell. 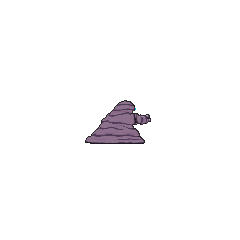 However, in recent episodes, Grimer's smell has seemingly ceased to exist. This is most obvious in Camping It Up! where Dawn is given a Grimer to train, and it immediately hugs her, but no one complains about any smell. Grimer shares similar traits to Koffing and Trubbish. All three Pokémon are pure Poison-types with a single evolution and roughly the same base stat totals. Alolan Grimer and its Alolan evolution were designed by Hitoshi Ariga. It appears to be a pile of living sludge. Grimer may also be based on the imagined fear that heavy pollution, caused by the leakage and/or improper disposal of toxic/radioactive waste, may result in the breed of new and undesirable life. Alolan Grimer may be based on an oil slick, particularly the multiple colors it produces when it mixes with water. 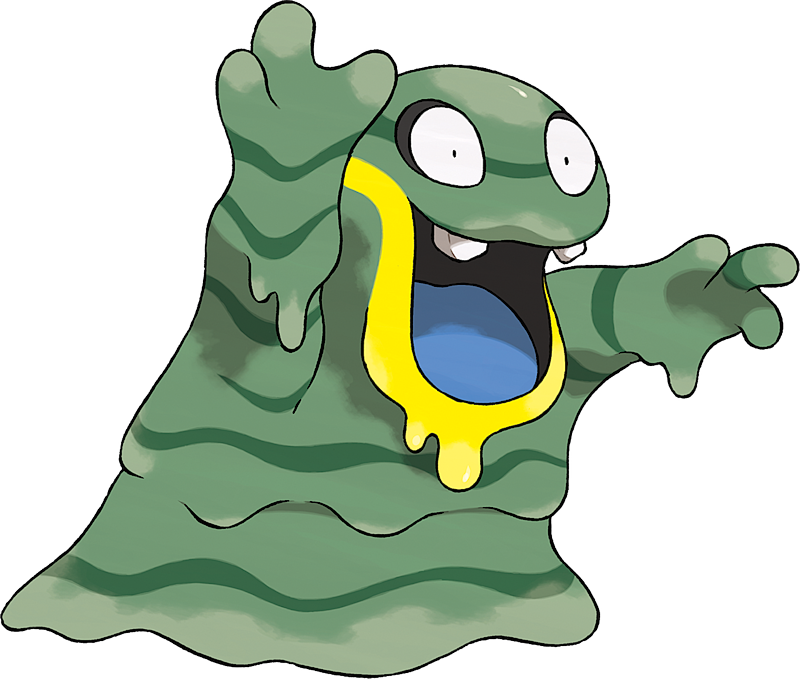 Grimer is derived from grime (dirt or filth). Betbeter may be derived from べとべと betobeto and べたべた betabeta, both meaning sticky. Cantonese Chinese 爛泥獸 Laahnnàihsau Means "Ooze beast"
Mandarin Chinese 臭泥 Chòuní Means "Foul sludge"